Whether you’re living in shared accomodations off campus, or in residence, there is one thing that you’ll have to deal with – roommates. Now, Urban Dictionary defines “roommate” as: A person you are forced to live with in a tiny dorm room,with who the University will ensure that you will not get along with. Someone who will make your life hell, no matter how nice you are. And sure, you might have heard horror stories from friends about their roommates – but, certainly from my experience, that has NOT been the case. Here at RU Student Life we want to give you 5 tips on how to be a good roommate and how to bond and become friends with yours! Be clear and open about your preferences for your living arrangements from the get-go. Make sure you know the needs of your roommate and they know yours. This way certain problems can be avoided. Make sure you have a schedule planned out on when each roommate is going to take care of cleaning duties. This way each of you will be able to be held accountable, and there will be no confusion on who is supposed to do what. This is really important, but often times very tricky. Adressing and confronting your roommate about an issue you are having pertaining to your living area is often times hard to bring forth. Try to confront and address when the issue is small, so when you first start to notice something, that way you avoid a bigger problem where most likely you have become more frustrated. Being open and honest is the best environment! Perhaps this might be the first time you have lived with another person, besides your family. We all have different backgrounds and have grown up with different rules and in different enviroments. The way that your roommate cleans may not be the way that you do, so it’s important to be open about changing the way you do things and compromising with your rooommate on certain things so everyone feels valued and comfortable in your living area. 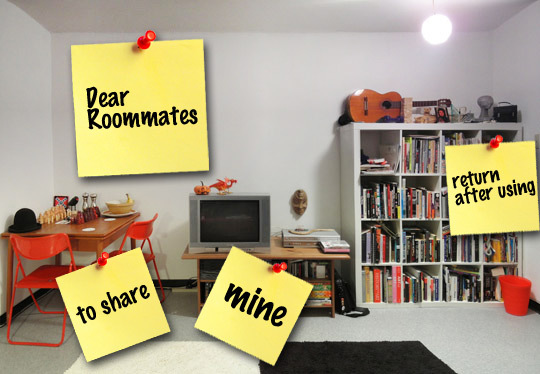 This is the most important aspect of being a roommate!! You must RESPECT one another. So don’t take a 30 minute shower at 7:30 a.m when you AND your roommate have class at 8a.m., don’t invite a bunch of friends over and party if your roommate has a midterm the next day, and respect their privacy. Respect goes a long way when you live with a roommate. Treat your roommate the way you would want your roommate to treat you!